Do you get your skiing kicks from exploring untouched territories, far away from well-prepared skiing slopes and efficient lift systems? In that case, you have come to the right place. 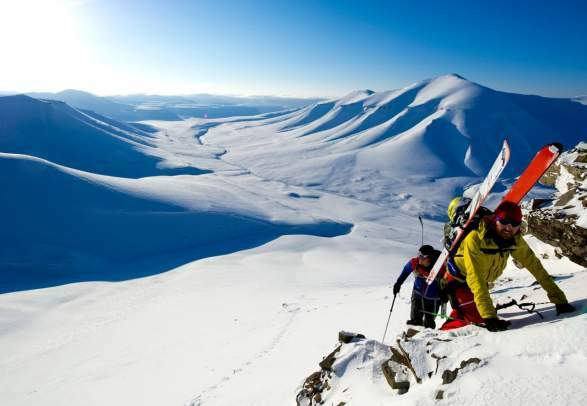 Your options for ski touring adventure in Norway, a country dominated by vast mountain ranges, are seemingly limitless. From glaciated peaks rising directly from the Arctic seas to breathtaking fjordscapes and remote alpine summits, there are off-piste areas to accommodate every taste. And with local experts on hand to guide you to the best places, unforgettable expeditions await skiers irrespective of skill and experience. It is strongly recommended to use a local ski touring guide in order to minimize risk. Stay safe and find out about the avalanche risk before you set out. You can check the avalanche forecasts at varsom.no. Take your skiing passion further on a sail to ski adventure where a boat will be both your accommodation and your means of transport. Head to the Sunnmøre Alps or the Hjørundfjord for crowd-free runs with fresh powder snow, or venture inland to areas like Jotunheimen to put your skills to the test in classic Norwegian mountain terrain with the deepest snow. For an exotic Norwegian ski touring trip, choose a destination up north, where the skiing action is likely to be amplified by a sighting of the northern lights. A few destinations to check out in Northern Norway are the Lofoten islands, the Lyngen alps and the island of Senja. Positioned 1,300 kilometres south of the North Pole, Svalbard is no doubt one of Norway’s most exotic and challenging destinations for a ski touring trip. Dominated by amazing peaks and surrounded by crystal-clear waters, Lyngen is a truly breathtaking destination to experience summit-to-sea ski touring. If the beauty of these Arctic islands doesn’t leave you breathless, the extraordinary ski touring experiences almost certainly will. Alpine terrain, cloud-capped peaks and untouched runs await in Scandinavia’s most mountainous region Jotunheimen - the home of the giants. Be sure to plan your trip with safety in mind, so do take a moment to read our advice below.